Eminent Domain is unlike any deck building game you've seen before! 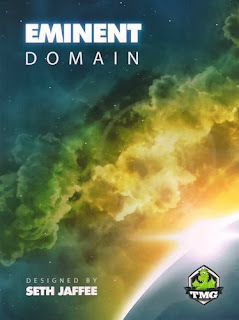 Eminent Domain is an empire building game in which your empire's abilities are based on a deck of Role cards. At the beginning of the game each player has the same deck of cards, with just two cards for each Role in it. Every turn players must choose a Role to execute and in doing so will add one of those Role cards to their deck. During the game players gain influence throughout the universe by expanding their empire, doing research, and trading. The player whose empire has the most influence at the end of the game will rule the galaxy! You can get a great overview of Eminent Domain in this video by Tom Vasel. You can find this game and other fantastic games on our shelves. So come in to Off The Charts Games where the selection of games is endless. We are located at 30 NW 2nd St in Historic Downtown Gresham.